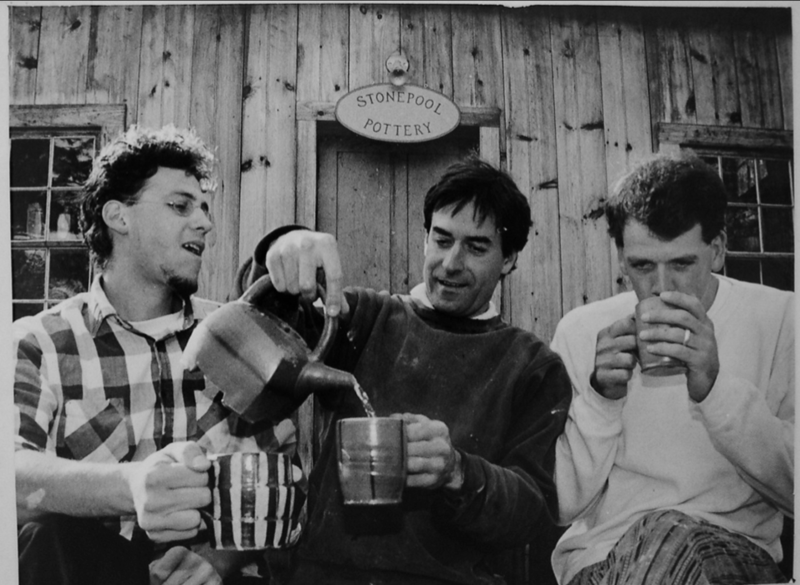 Stonepool Pottery evolved as a group situation—other potters have always been around. I began working with and firing with Michael Kline and Sam Taylor in about 1988. Michael, Sam, and I came up as potters together. We began working together, building a kiln at my place in Worthington and setting up a cooperative studio with little training, knowledge or experience. Instead of much schooling (Michael has the only degree in ceramics—or in any visual art—among us) or apprentice experience, we constantly made pots and fired together, and over time, learned from each other’s successes and failures. Ideas bounced around. Picked up by one, left by another, we often can’t recall who started a particular motif or form. One time recently when the three of us were having dinner at Sam’s house because Michael was in New England teaching a workshop, Sam said of the oval bottles that he and I were both making at the time, and which Michael had made in the past, “It doesn’t matter who started it. The question is, who’s going to finish it?” There has always been that playful competitiveness, pushing each of us forward, and pulling us back, too, when necessary. In 1989, we all took Michael Simon’s workshop at Penland School together. He played a pivotal role for all three of us in bringing coherence and the beginnings of an understanding of the great and expressive possibility of domestic pots. Michael Kline was already familiar with his work, as Ted Saupe, his undergraduate teacher, collected his work. When I arrived at the Penland workshop, Michael had 15 or so of his pots out on a table. I was overwhelmed by the sense of scale and power that they projected. In a gaze I took in how they were both completely compelling as objects in themselves, and absolutely certain about the context in which they belonged: the home. Most sculptural objects had for me failed to convey simultaneously both such formal aesthetic power and clarity of purpose. His pots projected an uncanny power and scale well beyond their hand-holdable size. This was a message I was ready to receive: it is possible to create objects with great complexity and meaning, with a clear and direct relationship to human activity. It has taken me quite a while to find my own way in the territory Michael Simon opened up for me during those weeks and since, and I am very grateful to him for it, and to Sam and Michael for companionship in exploring this difficult and exciting terrain. Michael shared my studio and kilns for a decade until he moved back to the Penland area in 1998. Sam fired here for a dozen years until he built his own kiln nearby in Westhampton. 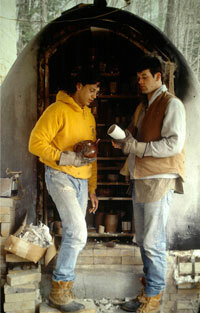 In addition to Michael and Sam, many people have participated in the life of the studio and the firing of the kiln over the years. Louise Harter, who has her own studio and kiln in Connecticut, and Wayne Fuerst fired with us through much of the 1990s. Keith Kreeger was a frequent visitor until he moved to Austin, TX. Scott Norris, a weaver and writer, hasn’t missed a firing since the turn of the century. Ellen Huie and Chuck DeWolfe were my early studio assistants. Fergus Moore, Steve Theberge, Michael McCarthy, Maya Machin, Daniel Garretson, and Jeffrey Lipton each worked at Stonepool as apprentices for three years. These days, Steve Theberge is back, sharing the studio with Mark and working at the nearby craft school Snow Farm.